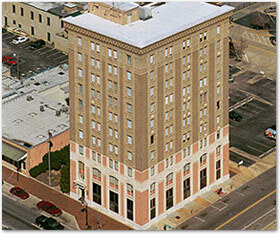 Seville Tower is an eleven-story office building located in the heart of downtown Pensacola and is the location of Merrill Land Company’s corporate offices. Listed on the National Register for Historic Places, this building was originally known as the American National Bank Building. Occupying the first floor, the bank’s lobby was highlighted by twenty-foot ceilings, Grecian marble floors, mahogany woodwork, bronze and brass fixtures and Doric columns. The United States Weather Bureau and the first Pensacola-based wireless telephone station originally occupied the top floor. The exterior has not been modified since construction was completed, except for the addition of the fire stairwells at the north and east sides of the building. The building was designed by J.E.R. Carpenter and constructed by Selden-Breck Construction Co. of St. Louis. The architecture is considered Sullivanesque. Upon completion in 1909, Seville Tower was the tallest building in Florida. Currently, there are spaces available for lease.